While Gears of War 4 players on Windows 10 and Xbox One have been able to play together via Social Quickplay since February, only the console version has had access to a form of ranked play. 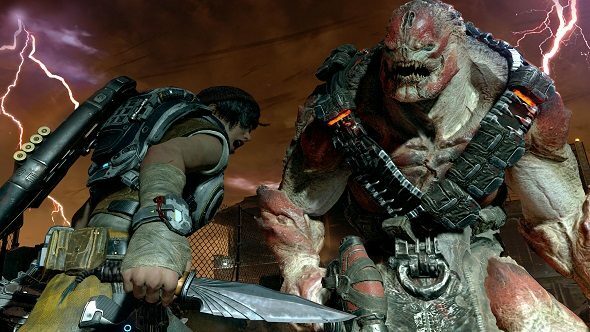 Well, this divide will soon come to an end, as The Coalition have announced ranked crossplay will be coming to Gears of War 4 later this year. Practice your aim with this list of great PC shooters. To ease those playing on Windows 10 into ranked play, The Coalition have released a temporary update which adds PC players into certain Core and Competitive playlists. For Core, you can now join in on the weekly rotating TDM or KOTH playlist. For Competitive, PC players can either play on Escalation or Competitive Warm Up, with Warm Up being the only Ranked playlist which currently allows crossplay. As the Seriously 4.0 and Ranked and Filed achievements require players to place in all Core and Competitive playlists, they were inaccessible to PC players. The Coalition are planning to rework these achievements in the upcoming May update. They will now only require placements in one Core and one Competitive playlist of the player’s choosing, rather than every single playlist. The ranked crossplay update should go live later this year, with Windows 10 and Xbox One finally roadie running shoulder to shoulder. However, as Windows 10 players will gain a natural advantage due to greater precision of a keyboard and mouse, the Coalition will implement a special ranked crossplay toggle for Xbox users. This will ensure that console players can choose to only compete against those using a controller, rather than getting their virtual heads kicked in by those using a mouse and keyboard. Conversely, this toggle will not be available to Windows 10 users. There is no hard and fast release date for this ranked crossplay update, but The Coalition are promising its release within the next few months.